229 x 342 mm, 9 1/4 x 13 ½ in. Prince of Wales Lodge in the south-east corner of Hyde Park next to Hyde Park Corner was built by Decimus Burton in 1825. Nash was the son of a London builder who trained as an architectural draughtsman at the Royal Academy schools. 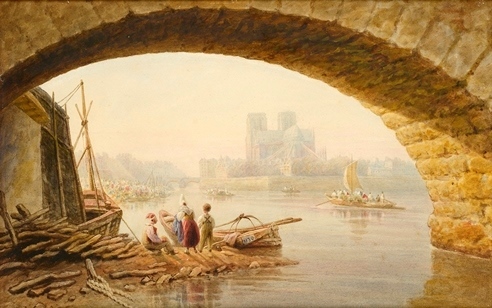 He travelled widely on the continent and is well known for his Paris views. 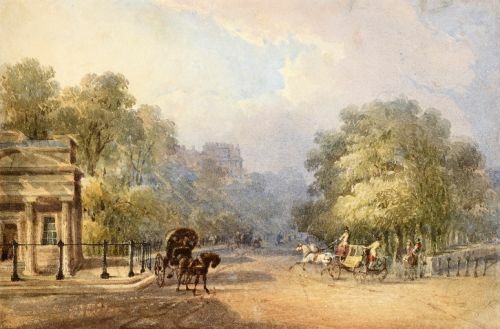 The present watercolour is likely to date from before 1834 when he moved from London to Brighton. 273 x 363 mm., 10 ¾ x 14 ½ in. 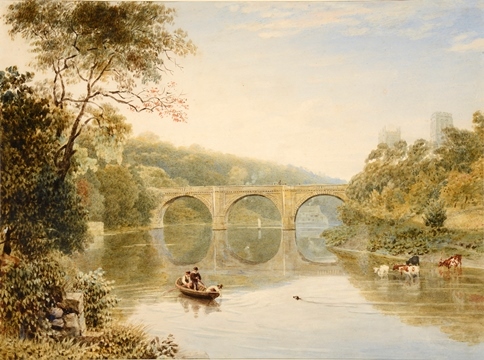 Prebend’s Bridge is one of the three stone bridges crossing the river Wear in Durham. It was built by George Nicholson between 1772 and 1778 replacing one which was swept away in a flood. 283 x 438 mm., 11 x 17 ¼ in. This is a view of the Cathedral of Notre Dame from the east, taken from under the Pont de la Tournelle. The stone bridge was built in 1654 and lasted until it was demolished in 1918 and replaced by the current bridge. Nash was the son of a London builder who trained as an architectural draughtsman at the Royal Academy schools. He travelled widely on the continent and is well known for his Paris views.